A bit of history, some helpful advice, and a lot of circles! Picking up a pen - the first letter families. The rest of the letters - and now we have a whole alphabet! Thinking about spacing, and bringing it all together. ​Numbers, punctuation and what do we do without capitals? 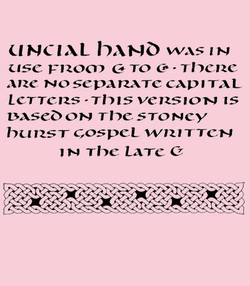 A final triumphant piece of uncial lettering!